The Government say things are getting better. They say jobs are being created. They say wages and prices are stabilising, whatever that means. They say the housing market is breathing again so that’s alright. So why does the Chancellor tell us that we need to have £24 billion in cuts to the welfare budget? And why does the Labour opposition agree that more welfare cuts are needed? For us there is no recovery. Friends are still losing jobs and the replacement versions are part-time and precarious at best. Prices for basic needs like food, electricity, water and rents are not “stable” but rising steadily, and the housing so-called “boom” just means that even renting is more unaffordable for all but a few. And for those on benefits the outcome of the long campaign of stigmatisation of the vulnerable is now obvious. Not only are benefit rates essentially frozen, so falling behind creeping inflation, for many the government is making savings by cutting them off completely. More and more people are being ‘sanctioned’, i.e. having their benefits reduced or stopped, for the most ridiculous reasons. Claimants did not cause the current recession. That was the fault of a speculative bubble created by the long-term capitalist crisis. The beneficiaries of that bubble were those at the top of the financial capitalist groups. They got huge bonuses for gambling with other peoples cash and had the legal knowhow to avoid paying taxes on their wealth. Today Her Majesty’s Revenue and Customs [HMRC] has 300 staff investigating tax evasion of an estimated £120bn. The Department of Work and Pensions [DWP] has 3250 staff investigating so-called benefit fraud of an estimated £1.2bn. Big business has fewer problems to face from any government than the poor. Sanctions are being implemented not simply as a response to the budgetary shortfall, part of it is as a response to the shortfalls in leadership and general competence from IDS' own department. The much awaited (?) Universal Credit – the big new change in the benefits regime – has been endlessly delayed through problems from above. It was initially estimated that the cost of implementing the new benefit would be around £34 million. It has cost around £164 million – around £140 million has simply been written off courtesy of software failures, confused leadership, administrative problems. It has been stated that the cost up to 2023 will be around £2.3 billion. More than two and quarter million claimants have been sanctioned according to the DWP’s own figures since the new regime took over. The numbers of sanction referrals has rocketed from around 5,500 to 6,000 per month since 2000 right the way up to 2007, since then they have slowly increased but it is only since the Coalition took office that sanction referrals have sky rocketed to levels we have never seen before. A study conducted by the DWP in 2006 showed that around 130,000 claimants in total were subject to sanction referral in a year. These latest figures are seeing figures of over 110,000 in a single month. Other pieces of anecdotal evidence include the Chesterfield man, previously a steel worker not working because of heart problems. At an interview conducted by ATOS (the French software firm brought in to investigate claims for benefit) he had a heart attack but was still sanctioned because they said he was fit for work. Several people like Shaun Pilkington or the registered blind man, Tim Salter, have committed suicide as a result of both benefit sanctions and the bedroom tax. Another iniquitous aspect of the sanctions is that DWP immediately inform Councils that they no longer are paying housing benefit so that the tenant falls into arrears without knowing it. The first they get to find out is when the bailiff is at the door demanding instant repayment. ... DWP staff have been set ‘expectations’ about the number of sanctions they should issue, despite ministerial denials that there are targets. Staff are required to do this under threat of disciplinary action through poor performance procedures if they are not seen to be meeting the ‘expectations’ set by DWP management. It is also a concern to PCS that the sanctions are now lasting for longer and at higher rates and are completely disproportionate to the so called offence, which can be as trivial as being a few minutes late for an interview. No, there are no quotas just “expectations”. The expectations the vulnerable, the unemployed, the sick, the disabled can have are what? The last Labour Government brought it in, the present Government is enthusiastically developing it: Workfare is part of the ruling class’ attack on wages and the social wage. The social wage (benefits, NHS, welfare provision etc) is part of what’s doled out to the working class (the SOLE creator of wealth) once profits have been made for our rulers. Economic crisis means the screws are put on wages and the social wage to protect profits. Hence pensions, wages, welfare and benefits are hammered, while the past 4 years have seen us pay 1.2 trillions pounds (that’s £1,200,000,000,000 ) to keep the banks afloat and their executives and shareholders in luxury. This robbery has been masked by a widespread propaganda exercise to convince us that our problems are caused by the work-shy, scroungers, and an ingrained entitlement culture, rather than an economic crisis and loss of jobs that’s none of our fault. The Labour/Conservative/LibDem wheeze is to force the unemployed, sick and disabled to work for their benefits, and thus drive down wages. Workfare is an attack on us all! The Work Programme helps employers squeeze their existing staff by cutting hours, cutting overtime, and creating a climate of insecurity. The government gains by ramping up sanctions against claimants (a Guardian report in April this year found DWP staff being pressurised into meeting weekly sanction targets). A sanction can last from two weeks to six months and can be applied for being late to, or missing, an appointment. Being sanctioned means loss of Jobseekers Allowance meaning claimants then have to apply for a hardship payment (a lengthy, stressful procedure) of around half of Job Seekers Allowance. 508,000 claimants were sanctioned last year. Remember, you are not a recipient of charity. You are claiming under an insurance scheme that you, your parents, grandparents and great grandparents fought for, and paid into. You didn’t create this financial crisis, you didn’t create the present joblessness. Those that did are facing no sanctions. Do not expect to see Fred Goodwin or Bob Diamond beside you at the Job Centre. The whole workfare programme has been declared illegal by the courts but rulings have been made in a legalistically confusing way allowing the DWP room for appeals and manoeuvres. All of those sanctioned courtesy of workfare rulings who have made claims for the return of benefits have been placed in a legally parlous situation. Some may be able to get those benefits back, some will have a long and hard battle, many will be disappointed. There are plans to reintroduce workfare under a different name and with a slightly different set of organizing principles – the work programme. It is now well-known that a notorious French software company ATOS runs the programme dealing with Employment and Support Allowance [ESA]. On behalf of the Government it carries out the Work Capacity Assessment [WCA] to re-assess whether those receiving the old disability allowances still qualify. Being an IT firm ATOS uses a so-called “logic integrated medical assessment”, often described as rigid and tick-box because computer-based systems make it very difficult for health professionals to exercise their professional judgment. Consequently because it has little or no regard to the complexity of the needs of severely disabled or sick persons, the British Medical Association and others have condemned the current WCA as not fit for purpose. The Work Capacity Assessment only marginally looks at health and actual capacity for work. It is just a stick with which to beat the vulnerable. According to the Government's own figures 1,300 persons have died after being put into the work-related activity group, 2,200 more people died before their assessment was completed and 7,100 people died after being put into a support group. 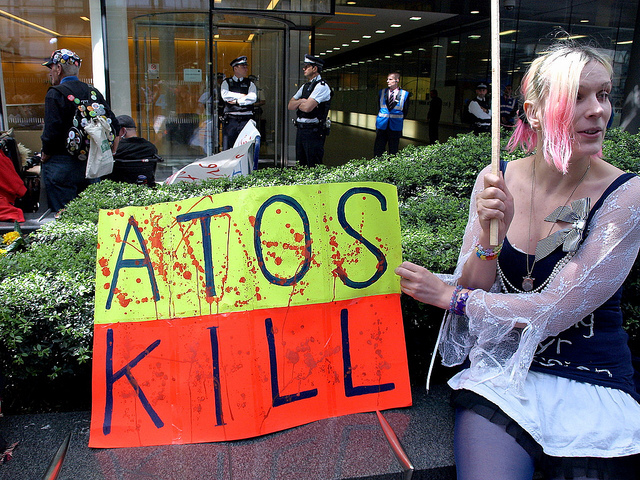 ATOS-related deaths are thus estimated as over 10,000 but they are fulfilling their purpose to cut welfare to those who need it. The attacks upon benefits is only part of the issue. The global capitalist system is in acute crisis. It can no longer afford the welfare state it established after the Second World War out of fear of what the working class might do. After thirty years of class retreat the ruling class now think they can reduce not only benefits but the cost of labour power in general. Their policy is like the nineteenth century one of “less eligibility” which is a posh way of saying that being on benefits will be so miserable that you will take any stinking job on any old poor rate of pay. As a class we are being driven into new depths of misery – with zero hour contracts, punitive and precarious working contracts and conditions and more! There has so far been only token opposition to all of these combined attacks upon the most vulnerable. The opposition comes currently from internet based blogs, petitions, some union projects and local welfare groups. Capital and its major agent, the state, has learnt to make its attacks piecemeal so that opposition comes initially only on an individual basis. Where and when there is opposition is often met by reformist demands (including the utopian idea that bringing back Labour will end our misery – they invented workfare remember). Such palliatives may be seen by some as victory and so quieten real opposition. But we must question the root of the problem – which lies in the overall failure of the capitalist system to live up to its boast that it is best of all possible systems, the ultimate mode of production in history. Hopefully our current doom comes before a new dawn of awareness that we need to organise ourselves as a class, rediscover our collective capacity to fight back and create a new society which does not abandon the weak, the old and the disabled. Not living in the garden of Eden anymore I didn't know about sanctions and am astounded to read this stuff. If it wasn't so unbelievably nasty because true, it actually reads like some outlandish joke. "You didn't clean your teeth this morning" - get sanctioned. "You're not wearing anything red, and its a red day today" - get sanctioned. Isn't it a bit like the "Monopoly" game, where you can get fined for throwing a bum dice and landing on a square with a punitive instruction. "You are fined a million dollars. Go straight to jail." That the bourgeoisie is now reduced by their decaying system of production to grabbing pennies off not just the eyes of the dead but from the most troubled and hard hit members of their oh-so-caring-society too; and employs an army to check up on the poor and needy while leaving the rich more or less to get on with their giant rip-offs un- sanctioned; somehow sums up the whole useless, daft and murderous capitalist system very nicely. On CNN last week it was revealed that 85 (yes 85) lucky punters own 50% of the world's wealth. Who gets a worthwhile proportion of the remaining percentage it didn't say. But it isn't anybody mentioned in the above article (for which article thank you) or anyone in work, or anyone you and I know. Surely the Current Doom can't last much longer and the Dawn of the New Awareness is on the way? The darkest hour is just before the Dawn, so they say! Lets hope they've got this right for once. I dont think what I have read says that 85 people own half the world's wealth, but the figure is pretty damning. 85 people own as much as the bottom 50% of the population.